I’ve been using a few new sensors in my training and coaching practice recently and learning a ton about central and peripheral limiters to performance. The sensors are the VO2 Master Pro wearable VO2 analyzer and Moxy muscle oxygen monitor. Together these sensors have given me a better view of systemic oxygen consumption (VO2), and local muscle oxygen saturation (SmO2). Huge thanks to Peter at VO2 Master Pro for allowing me to test their device for a generous trial period. And to Assaf at DRKHORSE Coaching for lending me the Moxy monitors for my own experimentation. Total haemoglobin (tHb) and Muscle Oxygen Saturation (SmO2) reported by the Moxy monitors tell us the total blood oxygen carrying capacity within the local tissue (tHb in grams per deciliter, g/dL) and the percent saturation of that capacity (SmO2 in %). The absolute and relative values begin to build a picture of local muscle aerobic capacity, ie. how well the muscle can extract and utilize the available O2 to produce power. Volume of Oxygen Consumption (VO2) should be well familiar by now, but read here for a refresher. The VO2 Master Pro analyses how much oxygen is getting in, and how much is coming back out. This reflects net systemic O2 consumption and can be used to determine how hard the body is working relative to maximal oxygen uptake (VO2max). The blood flow insufficiency issue with my leg is still ongoing and further investigations are underway, but at least this gives me the opportunity to study my performance and systemic response to two very different local tissue metabolic environments. Namely, my Right leg with sufficient blood flow & oxygen delivery, and my Left leg with a confirmed blood flow limitation and possibly also metabolic insufficiency. 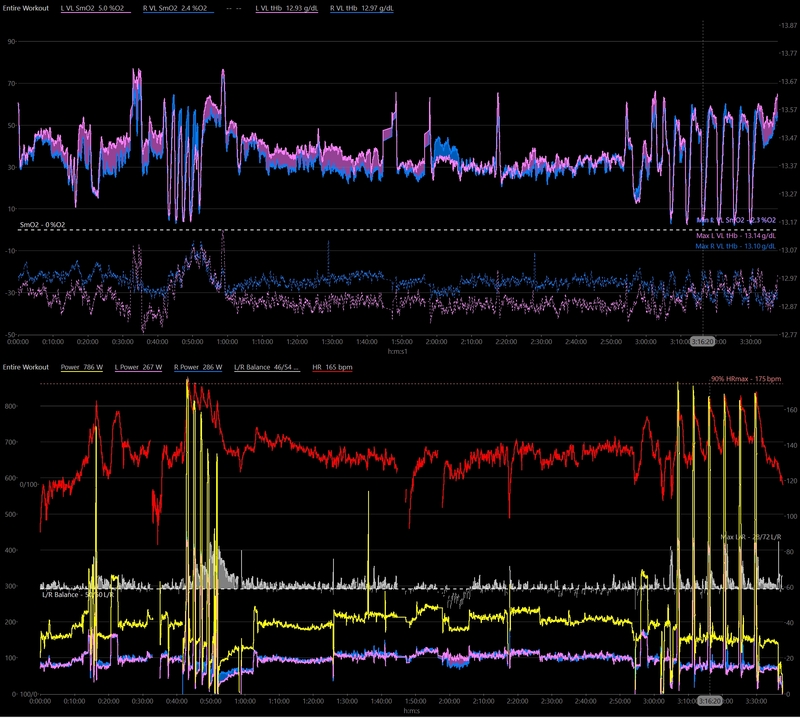 Today I want to start looking at a couple of tests I’ve done on myself, what the new data revealed, and how these devices might be used to diagnose potential limiters to performance. The first part of this workout was repeated all-out 30sec efforts, with 90sec active recoveries. The recovery intervals were short enough that the workout should (and did) quickly take me to failure. Note how R & L balance began to diverge already (grey area) after the second 30sec interval, but only during the recovery intervals. My power during the 30sec work intervals remained balanced, but the clear decline in net power through the workout suggests that the Left leg was the limiter in the standing sprints. The area highlighted in blue shows the growing gap between R and L leg power. By the second interval I was feeling the typical burning pain in my quad associated with blood flow restriction, and by the 5th interval the pain and cramp was so bad that I couldn’t even spin the left leg up, hence the false start and final short lived attempt. Let’s take a look at systemic metabolism via the VO2 Master Pro, showing us oxygen consumption (VO2). VO2 just barely touches 90% for the first three reps, indicating just how important aerobic metabolism still is for these predominantly anaerobic efforts. But after the third interval VO2 during both the work and recovery intervals begin to show a decline, along with peak HR. This could be caused by fatigue limiting my aerobic capacity upstream and decreasing supply of O2 to the working muscles. Or it could be reflecting a diminished response to reduced demand for O2 by the working muscles downstream. Let’s focus on SmO2 response during the all-out 30/90sec workout. Muscle Oxygen saturation of the L leg (pink) is actually higher at baseline. I’m very curious what this means, but I’m going to leave this question for another time. Both legs begin the first interval at roughly the same SmO2, giving us a good comparison of what happens during the work and recovery intervals. The work intervals show that both legs almost entirely deplete the available oxygen supply. SmO2 de-saturates from a high of ~60% to under 5%. This demonstrates that both muscles are equally able to utilize and convert oxygen into power during the work intervals. Possibly even indicating a supply-side limitation. If my cardiovascular system could deliver more oxygen, could the muscles produce even more power output? 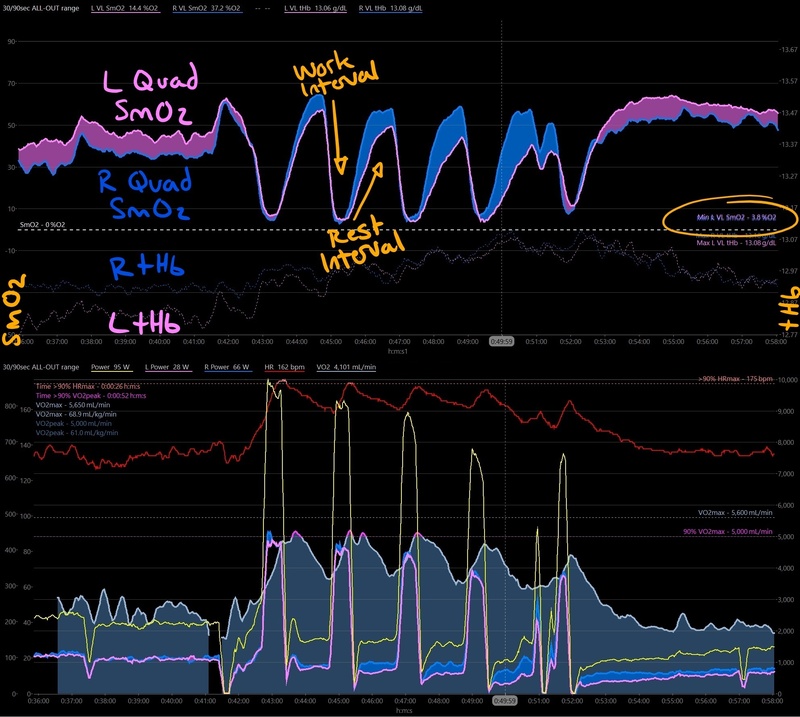 However even the first recovery interval shows that the L leg is slower to recover and unable to re-saturate muscle oxygen to the same capacity as the R leg, despite the R leg actually working harder by 30-40 W. The blue highlighted areas in the top chart show the growing gap in SmO2 re-saturation between R & L legs as the intervals continue. If the R leg is unaffected, the limitation must be somewhere downstream. And because it appears that O2 re-synthesis during recovery is more affected than O2 consumption during work intervals, I interpret this to be consistent with the hypothesis that tissue metabolic extraction of oxygen is sufficient, while O2 delivery to the tissue is the limiting factor. I’ve been able to play around with two very cool training devices: the VO2 Master Pro wearable VO2 analyzer, and the Moxy muscle oxygen monitor. Full depletion of SmO2 before attainment of VO2max may indicate supply-side (O2 delivery) limitation. Limited depletion of SmO2 combined with other respiratory metrics (FeO2) may indicate demand-side (muscle O2 utilization) limitation. As for my own pathological blood flow limitation, oxygen utilization capacity seems to be equal between legs, while oxygen re-synthesis of L leg appears limited. Decreased ability of L leg to recover and re-saturate muscle oxygen at the same rate as R leg during recovery intervals suggest O2 delivery limitation somewhere downstream of the descending aorta bifurcation. So far I’ve only discussed the first half of this workout. After the all-out 30/90sec intervals I allowed the leg to recover, got some aerobic volume in, then repeated the 30sec work intervals in a fatigued state. This time however I gave myself 4min complete recovery intervals between efforts to compensate for the decreased rate of SmO2 re-saturation in the L leg. The comparison between these two interval protocol within the same workout revealed even more about how the L leg limitation interacts with changes in oxygen supply & demand during work & recovery intervals. Actually on MRA & CT scan I don’t have significant fibrosis, but we suspect I have functional kinking of the artery. Further investigations are underway. I did not see that post… 🤦. I was worried that it could be a very serious condition and you were not aware… Glad you are already taking care! Haha, no worries. I appreciate the sentiment! It’s definitely not a well known condition, although it’s being diagnosed more and more. Pauline Ferrand-Prevot is the latest pro to have it diagnosed and to go under the knife to repair it. I hope we’ll be able to clarify what’s going on with my artery soon and find a fix, surgery or otherwise… In the meantime I get to run some very interesting experiments on myself and learn from some of the top experts in the field!